Two ferries crossing the Bodensee – one between Constance and Meersburg, the other between Friedrichshafen and Romanshorn – are integrated into the public transportation network within the Bodensee region and thus play a key role in the infrastructure of the area. More so, however, the ferries act symbolically with contrary meanings being expressed and in doing so they simultaneously symbolize the dividing and unifying element of the region. Contributing greatly to the mobility of the region, the Bodensee ferries establish an interconnection where none had been, and in this process, they let the dividing effects of the expense of water between the shores appear irrelevant. The ferries – regarded as shaped metaphors–reinforce the symbolic connection across the lake. The ferry traffic is embedded in an imagery in which differing meanings are visualized. It is caught between the conflicting priorities of being a means of transportation on the one hand and a tourist attraction on the other. 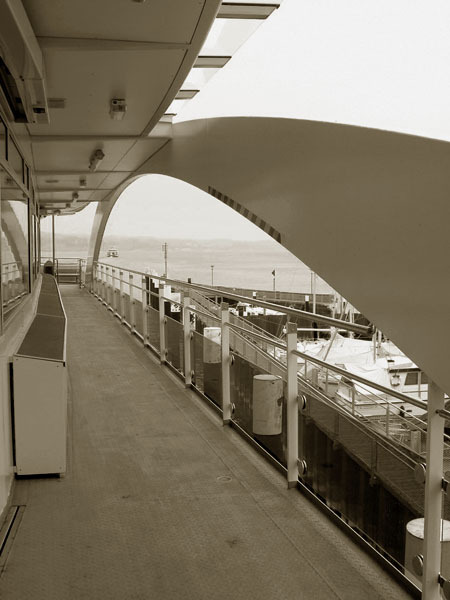 Glass as the basic material in combination with the open, airy architecture of the ships put the Bodensee on stage: Similar to a touristic trip, the ferries enable an intense aesthetic perception of the lake as such and therefore emphasize the aesthetic experience of the Bodensee. In this staging, the Bodensee can be experienced as a common, uniting space. Mandatory national borders – in terms of a defined line – are nonexistent on the lake, since the expanse of water “belongs” to all three of the neighboring countries. Despite this fact, or maybe due to this fact, the border as such is articulated more explicitly especially in the harbors–the border is made experienceable and conceivable in its own imagery. 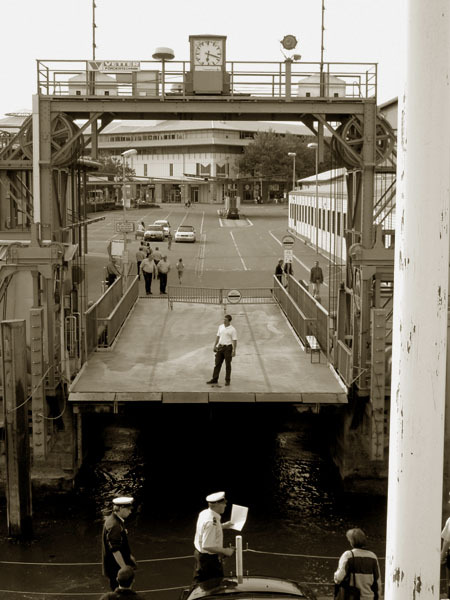 Therefore, the ferry traffic communicates and depicts the national border in its prevalent symbols–fence, customs sign, border guard, behind which the importance of the impression of interconnectivity fades. The ferry traffic between Germany and Switzerland establishes the border as a realm of images and experiences, in which the separation through the lake seems annihilated indeed, but the division of both countries through the national border is perpetuated and emphasized constantly. „Die Bodenseefähre, die auch von Fußgängern und Radlern genutzt werden kann, verkehrt zwischen Friedrichshafen-Romanshorn ganzjährig im Stundentakt. Der Fährebetrieb wird gemeinsam von der Bodensee Schiffsbe­triebe GmbH und der SBS Schifffahrt AG betrieben.